Over the holidays, I was going through some old photographs and I came across this one of me and my great grandmother, taken a few days before Christmas 1998. She was very old and frail at that point, but still stubbornly independent, quick-witted, and insistent on living on her own. 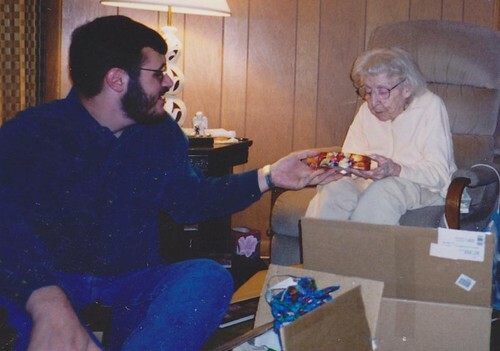 For Christmas that year, we brought her several boxes of prepared and easy-to-prepare food items and other things that would make her continued independent living easier. There are a handful of people in my life that I have missed greatly since they’ve passed away. She’s very high on that list. This is my favorite new song of 2011. There’s just something about it that hits me right here in the chest. I believe one of the best gifts I can give to my children is the gift of the joy of reading. Reading is about the acquisition of knowledge, the growth of one’s morals and values, and the enjoyment of a vast literary heritage. There are few things more valuable to do with one’s time. Ever wondered how much you should be paying for an item? This site simply aggregates data from all over the internet so that all you have to do is type in the name of an item and it gives you a rough estimate of what you should pay for it. This is one of those things where there’s the kernel of something great and you can just see the potential for this to turn into an essential tool. I love browsing old public domain photographs. Every once in a while, one pops up that makes me feel more human. 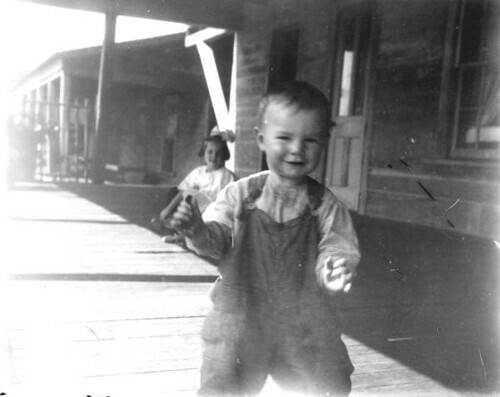 The above picture was taken in approximately 1900. The look of impishness on the boy’s face reminded me greatly of the looks that my one year old son often gives me when he’s toddling around the house and has come up with some idea that will surely cause a mess. Some things never really change. The difference between people who succeed and those who fail is the ability to consistently finish, particularly at the important things. Do we want to get things done or leave things half-undone? Billie Holiday is one of my favorite singers ever. She just grabs those notes and turns them into something magical. I hope there’s an afterlife so that I can someday sit down and listen to and watch this amazing woman sing. Over and over again, I find the people who succeed at things aren’t the people looking for the financial success. They’re just looking to do something well because they love it, and when they achieve that good thing, the world beats a path to their door. There are variations on this quote in every field. I find it is even true for me. A friend of mine passed this along to me recently, asking me to watch it and think about it. Regardless of how you feel about the idea behind it, it’s powerfully delivered and thought-provoking. Funerals bother me a great deal. I’m troubled by how people often show up and act incredibly distraught about someone that they didn’t have time for when they were alive. I often wonder what the people who passed on would think about all of it. And clicked their tongues, and watched me, mournful-eyed. And what ecstatic meeting ours would be. Moved by the lovely tale, they broke, and cried. And left to tell of all the help they gave. Would laugh, could you have heard the things they said. I hope that when my time comes, people tell a lot of good jokes and funny, happy stories about things I did.